What is the closest non-bonding H…H distance within a single molecule? The world record had been 1.617 Å in a pentacyclodecane.1 This record now appears to be broken by the preparation of the disilane 1.2 The 1H NMR and IR suggest the interior hydrogens are very close. The x-ray structure of 1 indicates a very short Si-Si distance of 4.433 Å, a distance that must accommodate two S-H bonds, typically about 1.48 Å and the H…H non-bonded distance, which might be as short then as 1.47 Å! The crystal is unfortunately not large enough for a neutron diffraction study, which would enable precise location of the hydrogens. (1) Ermer, O.; Mason, S. A.; Anet, F. A. L.; Miura, S. S. "Ultrashort nonbonded hydrogen…hydrogen distance in a half-cage pentacyclododecane," J. Am. Chem. Soc. 1985, 107, 2330-2334, DOI: 10.1021/ja00294a023. “Any ideas for a compound with an even shorter non-bonded H…H distance?” I think it should be possible to tune the system X-H…H…Y where X is electropositive and Y electronegative. If X=B and Y=N, one can get sensible dihydrogen bonds, but these are quite long at ~2.0Å, as in for example the crystalline H3BNH3. By tuning, one can decrease the H…H distance, but at some point of course it gets so short that H2 gas starts to extrude. I presume cations such as CH5(+) do not count? I remember coming across a short one (only computationally) which might have been shorter than the above, but the barrier to the extrusion was tiny. If I remember where I saw it, I will update you. I was intrigued by how the Si-H…H-Si stretching modes would emerge from a calculation (doi: 10.6084/m9.figshare.812562). Mode 191 (ν 2406 @B3LYP+D3/TZVP is the antisymmetric combination which stretches one Si-H and contracts the other. It also of course constitutes a H…H stretch. The symmetric mode is ν 2460 cm-1. But both modes are quite odd; I cannot show an animation here in a blog comment, but in each case the contribution from one of the Si-H bonds is far greater than the other; both modes exhibit very odd asymmetry. I dare say one should be able to work out from these modes whether the H…H force constant is positive or negative (i.e. whether the H…H region is attractive or repulsive). I suspect it must be the latter. Are there any experts in normal mode analysis that could comment on this odd behaviour? Oh, in this model, the H…H distance is 1.563Å but the Si-H length seems compressed at 1.450Å. All three bonds therefore are acting under compression. Steve: Is it possible for you to animate the modes using Jmol from the log file archived above (it is not possible to embed a Jmol in a post comment!). In his previous post, Steve commented on the use of QTAIM analysis of hydrogen-bonded systems. This juxtaposition led me to remember I had come across a system in which a total of six bond critical QTAIM points to a single hydrogen atom can be identified (see here). Of course in that instance, one would be unlikely to try to claim that the hydrogen was hexavalent, but it certainly is hexacoordinate (I do not believe any higher coordination for H has been identified, but even this value might come as a surprise to many!). 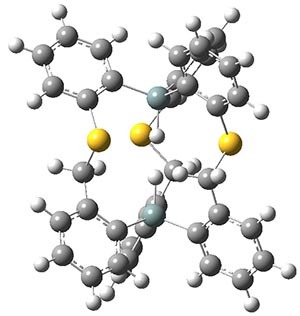 So it might come as less of a surprise to find that QTAIM of compound 1 above (doi: 10042/25142) reveals that both hydrogens in the internal Si-H unit have five bond critical points associated with them. Rather then being merely e.g. bifurcated, these hydrogen “bonds” appear to be pentafurcated. The value of ρ(r ) at the H…H bcp is 0.025 au, which is high indeed (a typical hydrogen bond is ~ 0.01). The ∇2ρ(r ) Laplacian is +0.108, which implies repulsive covalency. This molecule reminds me in some ways of [1.1.1] propellane. That central C—C region (which can be regarded as compressed, in the same way that the H—H region for the SiH system is) was thought to be of sufficient interest to have induced a (very difficult) high-angle X-ray measurement of its electron density (doi: 10.1002/anie.200501734). This experimental density was then analysed for its Laplacian, ∇2 ρ(r ), which turned out to be positive, as I computed for the H…H region. Perhaps, rather than just hoping a neutron study comes along, we might also ask for a high-angle X-ray study? Neutrons are fine for finding out where atoms are, but you do need electrons to find out where bonds are! I suspect that the “highly compressed” diatomic interactions (significantly less than the sum of their van der Waals radii, 0.9Å in this case) will turn out to challenge our thoughts of what a “chemical” bond is. Or to put it another way, the “physicists” bond and the “chemists” bond may indeed diverge for such systems. I have added predicted NMR spectra for this compound on my blog. The 29Si matches extremely well, the 1H a little less so. But of greatest significance is that calculation predicts a through-space proton coupling of 5.4Hz. The experimental spectrum shows no sign of such coupling. Which does lead one to wonder if the true orientation of the two Si-H bond axes are collinear, or bent. If the latter, the two hydrogen atoms would move apart (and the remarkably short distance claimed in this article would be less so). It might be that the absence of such H…H coupling is perhaps hinting that the H…H distance is in fact not short? Certainly a low temperature NMR might help establish if there is any such H…H coupling or not! Another experiment is required! Nay essential!! One more observation. The reported 1H NMR spectrum is shown below. It is kind of difficult to extract couplings (especially the 29Si satellites) from it without the raw data files. So this is very much a plea for the use of digital repositories to store the type of data associated with experiments that would enable others to magnify and analyse some previously un-anticipated aspect! Bob Pascal kindly provided more data, not only for the above compound but also a Si-H…P analogue. The Si-H couplings are here, and the P-analogue data here. I think a very convincing case has been made for characterising this system as having a highly compressed bond. The interesting aspect now is whether this compression results in any form of identifiably unusual behaviour for the electron density in the H…H region or not. In his original post, Steve asked “Any ideas for a compound with an even shorter non-bonded H…H distance?” A trivial compression would be to replace S by O. In which event the NMR reveals a through-space H-H coupling of +8.0Hz, and an eye-watering H—H distance of 1.47Å, which would be another record. The IR has elevated Si-H stretches of 2452 and 2523 cm-1 indicating a stable C3-symmetric minimum with no distortive imaginary modes. Whether this system can be made in a lab remains to be established. One must presume that at some stage, further attempts to compress the system would result in the two H atoms sliding past each other, and loss of the three fold symmetry. In footnote 10 of DOI: 10.1021/ja407398w, non-symmetric conformations are noted as being of higher energy, but there it is claimed that these have even shorter H…H contacts. None are reported there with longer, dislocated H…H distances. Yes, there is! See my joint paper with Dr. Firouzi just posted to arxiv: “http://arxiv.org/abs/1306.6350” for examples of shorter non-bonded H…H distances. we have reach to distances as short as 1.38 Å however, I think even shorter distances are also possible to be realized at least computationally. Bob Pascal has sent two very detailed follow ups to much of the above discussion, which I highly recommend anyone interested read. 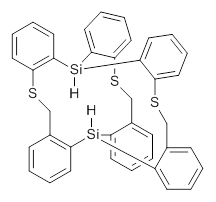 We have just designed some new unsubstituted hydrocarbon structures with H…H contacts below 1.2 A. This is a new world record.